Not all that long ago it was not uncommon to hear of the Churching of Women, sometimes called Thanksgiving after Childbirth, as it was after all a dangerous and risky business. We are perhaps now not quite so used to ideas of ritual purity inherent in the Thanksgiving for a Woman after Childbirth, or her re-admission into society after a period of confinement. But the Law of Moses required that forty days after giving birth the mother was purified in a mikvah, a ritual bath and that her son, as a first-born male was presented to the Lord. This week the Church celebrates the Presentation of Christ in the Temple, also known as the Purification of the Blessed Virgin Mary and commonly called Candlemas, from the ceremonies which saw the candles for the coming year blessed at this service, so that they may burn as lights which proclaim Christ, the true Light, the light to lighten the Gentiles. They are different titles, but one feast, which make us think about who and what Jesus Christ is, and what he does. It is hard to see how it could be any clearer. Just as Abraham was willing to sacrifice Isaac on Mt Moriah, so now God will gladly give His only Son, Jesus Christ, on the altar of the Cross, to restore our relationship with Him. The Holy Family go to the Temple to give thanks to God and to comply with the Law, just as they had in circumcising their baby on the eighth day: and in so doing they demonstrate obedience, they listen to what God says and do it and as such they are a model for all Christian families to follow – we need to be like them, listening to what God tells us and doing it, regardless of the cost. The promise made to him by God, revealed through the Holy Spirit, has been fulfilled in the six-week-old infant in his arms. Simeon can prepare to meet his God happy in the knowledge that Salvation has dawned in this little child. As Christ was made manifest to the Gentiles at Epiphany, so now His saving message is proclaimed, so that the world may know that its salvation has come in the person of Jesus Christ. Simeon speaks to Our Lord’s Mother of her Son’s future, and the pain she will endure at the foot of the Cross. Before he dies Simeon is looking to the Cross, the means by which our salvation is wrought, the Cross at which Mary will stand to see humanity freed from its sin through the love and mercy of God, through grace, the free gift of God in Christ. So as Candlemas concludes our celebration of Christmas, and the mystery of the Incarnation, so to it points to that which gives it its true meaning: the Death and Resurrection of Jesus Christ. The Feast prepares for the coming season of Lent by changing our focus and attention from Jesus’ birth to His death, for our sins, upon the Cross. That is why we are here this morning, to be fed by Christ, to be fed with Christ, truly present in His Body and Blood, Soul and Divinity. A God whom we can touch and taste. A God who shares His Divine Life with us, so that we can be transformed by Him, built up as living stones as a temple to His Glory, and given a foretaste of Heaven here on Earth. This is our soul’s true food, the bread for the journey of faith, a re-presentation of the sacrifice which sets us free to live for Him, to live with Him, through Him and in Him. The significance of what is happening is not just recognised by Simeon, but also by Anna, a holy woman, a woman of prayer, a woman who is close to God, she recognises what God is doing in Christ, and she proclaims it, so that God’s redemption of His people may be known. Let us be like her, and let all of our lives, everything which we say, or think, or do, proclaim the saving truth of God’s love to the world. So let us burn, like the candles which God has blessed, let our faith be active to give light and warmth and hope to the world, so that it may feel that love and warmth, and come to believe and give glory to God the Father, God the Son, and God the Holy Spirit, to whom be ascribed as is most right and just all might, majesty, glory, dominion, and power, now and forever. The feast of the Epiphany which we celebrated a couple of weeks ago, is the Manifestation of Christ to the Gentiles. It shows the world that Jesus Christ is God born among us, and points forward to two marvellous miracles. The first is the Baptism of Christ, which we celebrated last week. Jesus shows humanity the way back to the Father, through baptism, and we see the Holy Spirit active in the world. Secondly, this morning, we turn to the first of Jesus’ miracles which took place at a wedding in Cana. A wedding is a very happy event, celebrated by the whole community, and a jolly good excuse for a party, which in some cultures can go on for many days. Jesus, His Mother, Mary, and the disciples have been invited to a local Galilean party. The happy couple were fairly young, and probably not all that well off. Even so, they would have still put on a huge spread with lots of wine to wash it down. To run out of wine would be seen as a cause of shame and disgrace. The couple and their families would have been shown up in public. This is a culture which valued such things highly, so losing face is a very serious matter indeed. Consequently, when Mary tells Jesus that they have run out of wine, what we are looking at is something of a disaster, a source of shame, a nightmare to be avoided at all costs. Jesus’ reply to His Mother, ‘Woman … come’, could be seen as curt and dismissive. However, He is not being rude, instead His remark refers to a far larger context than the wedding, the whole of His Earthly ministry in fact. He tells His Mother that it is isn’t their problem, and states that His hour has not yet come:It is not yet His time. Jesus’ hour comes with His Death upon the Cross, when he will wipe away our sins, and take all our shame upon himself. Mary’s response is instructive. Despite what Jesus says to her she instructs the servants to, ‘Do whatever He tells you’. In this simple phrase she shows us that the key is obedience to the will of God: Listen to what God says and do it. It is that simple and straightforward. As Christians we need to follow her example. Our life should be rooted in obedience: we need to listen to God and obey, for our own good, and the good of the Kingdom. We need to follow the will of God and not be conformed to the world and its ways. We need to truly enter into the joy of the Lord, in humble obedience, be fed by Him, and fed with Him, who died for love of us, in submission to the will of the Father. Jesus tells the servants to fill the water jars to the brim. Most of us have outside our houses one or two wheelie bins, which each hold about 30 gallons, or 240 pints of beer. Multiply that by 6 and you’re looking at the equivalent of 1,500 pints of beer, in the Ancient World people drank their wine diluted down to about 5% abv, or two parts water, one part wine. The wedding party was well underway. An extravagant party, but it points to something greater than itself. It is a foreshadowing of the joy of the Kingdom. It is a taste of the lavish excess that our God, whose love and generosity are beyond our understanding, wishes to bestow on us, as a sign of His love for us. The world today struggles somewhat with extravagance, and rightly so: when we see the super-rich riding around in gold-plated supercars we are right to be concerned, yet in the Gospel we see something strange. The head steward had a point: you serve the best wine first, while people are sober and can appreciate it. The Kingdom of God, however, turns human values on their head – the joyous new wine of the Kingdom is finer than any human wine. It is lavished upon undeserving humanity, so that it might transform us, so that we might come to share in the glory of God, and his very nature. Christ therefore becomes the true master of the feast, as He will feed humanity from the abundance of the Heavenly Wedding Feast [Revelation 19:6-9], as He will feed us here, today. Thus, as we start this new year, we see a three-fold dawning of the Glory of God in Christ Jesus. First Our Lord’s manifestation to the Gentiles, the proclamation of the Messiah to the whole world, Then His Baptism, which shows us the way to the Father, a sign of love and obedience, and now the Wedding Feast at Cana, a sure sign of the superabundance of God’s love. It is shown to us here today in the Eucharist, where we drink the wine of the Kingdom, the Blood of Christ.This transforms us by the power and the grace of God, so that we may share his Divine life, and encourage others to enter into the joy of the Lord. Jesus is the Lamb of God who takes away the sins of the world [Jn 1:36]. He holds nothing back for love of us. He replaces the sacrificial system of the Jews, so that as both Priest [cf. Melkisedech] and Victim he may reconcile us to God. The Wedding at Cana points to the Cross, as it is when Jesus’ hour comes, when He sheds his blood for us It removes all our shame, all the sins of humanity, so that we can enjoy forever the banquet of God’s love prepared for us in Heaven, and it is shown and foreshadowed here under the outward forms of Bread and Wine. So let us feast on the Body and Blood of Christ so that we may be transformed more and more into His likeness. Let us live out our Joy, and share it with others so that they may come to believe and give glory to God the Father, God the Son, and God the Holy Spirit, to whom be ascribed as is most right and just, all might, majesty, glory, dominion and power, now and forever. As we approach the end of another year it is natural both to look backwards and forwards, to what has been, and what will be. Ideally we would do both in a positive fashion, grateful for what has been, and hopeful for the future. It isn’t as easy as it sounds: the world feels a worried, troubled place with the risks of war and terrorism, political instability, economic insecurity, and unpredictable weather, to name but a few. It isn’t pleasant to dwell on such matters, and it seems that there isn’t that much that you or I can do about them. As Christians we are called to be people of joy and hope, emotions which are encapsulated in the Feast of Christmas, which we continue to celebrate for either twelve or forty days, leading up to the Epiphany or the Presentation of Christ in the Temple. The Church, unlike the world around us, doesn’t stop celebrating the birth of Jesus Christ for some time yet because it is so important to take some time to think about God has done for us in being born for us. The shops around us have cleared their shelves for Valentine’s Day or Easter Eggs, but we are not so hasty. The awesome truth that, by the power of the Holy Spirit, God has taken flesh in the womb of the Blessed Virgin Mary, and that the Son, Jesus Christ has been born for us, should make us pause. God is not remote, a distant disinterested Creator. He becomes human, and is born like we are. God gets involved, and shares a human life, its joys and its pains, and its end: death. God does this for us. This is grace, an unmerited gift, something we don’t deserve, so that we might know His love. God becomes a human being so that humanity might become divine, so that we might share in the Divine life of love. God loves us, not because we deserve it, or that we have somehow earned our way to Heaven, but so that we can know Him, love Him, and serve Him, in Earth and in Heaven. God shows his love for us in being born as one of us, sharing our humanity, so that we might share His Divinity. In Jesus Christ we can see and know who and what God is. This is the mystery of the incarnation. It is something we cannot fully understand, in this earthly life at least, but it is something we can begin to experience. We can have hope for the future, in and through Christ, however bad the world around us is. Through Him we can know something of healing, reconciliation, and forgiveness. No matter how many mistakes we make, and what ever mess we are in, it is something which God in Christ can deal with. This is not to say that God has a magic wand to wave over our problems, but rather that we see our problems in the broader context of God’s love for us, another way becomes possible, and this is where the Kingdom breaks into our lives. Our first reading this morning sees the prophet Isaiah proclaiming the hope of the Messiah, hope for the people of Israel, which is fulfilled in the baby born in Bethlehem, Jesus, our Saviour. Isaiah trusts God to fulfil His promise, and looks to the future with hope. He sees the future in terms of a wedding – a cause of great joy. It signifies a restored relationship, something Jesus will bring about himself, on the Cross, to heal our wounds through His. This is Good News, and it fills us with joy. The reading from Paul’s Letter to the Galatians reminds us that the Incarnation has changed everything. It is an event in history which happens at the right time, when people are mature enough to understand what is happening. God sends His Son, born of Mary, to redeem us, and to adopt us, to bring us into God’s family, so that we can receive our inheritance, the gift of the Holy Spirit, to fill us with God’s love. We are included, we are adopted. Rather than being disinherited, which is what we deserve, men and women are adopted through Christ. In Jewish law inheritance was about passing property from fathers to sons, Paul shows how Jesus has re-written the rules: men and women are treated equally, and brought into the inheritance of the Kingdom of God’s love. This is great news, a departure from the ways of the past, a sign of radical equality in and through Christ – salvation is God’s free gift, restoring the dignity of humanity. In Luke’s Gospel we see shepherds who have just been told the most wonderful news: the Messiah, the Saviour is born in Bethlehem. They decide to go and see what God has told them. They make haste, they hurry, they are excited. They see Mary and Jospeh and the baby lying in a manger, a stone trough for animal feed. They see a baby wrapped in strips of cloth, just like the lambs they raise to be sacrifices in the Temple. They see One, who from his birth has been marked out to be the sacrifice on the Cross which will restore Israel, and bring about a true passover. The shepherds see something amazing and they tell people about it – it is Good News. God loves us this much. They go back to their flocks praising God for what they have seen – salvation in their midst, in the person of Jesus Christ. Mary said “Yes’ to God to bring these things about, now she ‘ponders these things in her heart’ she reflects on what has happened. Having been obedient she turns to God in love and worship and prepares to be obedient to the law of Moses, and the covenant, the agreement which God first made with Abraham, two thousand years previously. Mary and Joseph are obedient to the Law and so their Son is circumcised on the eighth day (Luke 2:21). He receives the sublime name, Jesus, that is to say God is our Saviour. God saves us. We hear His words in Scripture, and here in the Eucharist we are fed by God and fed with God, with His Body and Blood, broken and shed for us, that through His death we might have life in Him. So let us come and share in God’s generous gift to us, to heal us, to restore us, and give us hope in Him. God’s salvation, the saving of humanity, is an act of love and obedience. So as we continue to celebrate Christmas and are filled the joy of the Incarnation, let us also reflect upon the fact that Love and Obedience and Suffering go hand in hand. They are costly, and likewise, for us in our Christian lives, following Christ means embracing love, obedience, and suffering, bearing witness to the truth that God loves all of us, gave his life for us, and asks the same of us. At one level, God is completely beyond our understanding: we cannot comprehend the majesty of God, or the depth of God’s love for us. Yet in Christ, the Word made flesh, we catch a glimpse of what God is like. Likewise Jesus speaks in parables to explain what the Kingdom of God is like – to convey in words and images which we can understand, something of the majesty and wonder of the life lived in union with God. This morning’s gospel gives us four images to ponder: the Kingdom is like a mustard seed, it is a a small thing, only a couple of millimetres across, which can grow into a plant large enough that birds can nest in it. Likewise our faith may be small, we may not think that we’re terribly good at being a Christian, at following Jesus, but if we live out our faith in our lives together, then our faith can, like a mustard seed, grow into something amazing: it can be a place of welcome, a place that birds can call home. It becomes a reality in the world, something which we share, a place of joy, filled with the Holy Spirit. The Kingdom is like yeast – a small bit can rise an awful lot of dough. It’s alive, and it makes bread – a basic foodstuff – that nourishes us, that gives us life. It reminds us that Jesus is the living bread who came down from heaven, which is why we are here, now, today, to share in that same living bread. We are here to partake in the feast of the Kingdom, where Christ gives himself for us, under the outward forms of bread and wine, so that we may have life in him, and have it to the full, it gives us life, it nourishes us, and gives us a foretaste of heaven, and of eternal life in Him. The kingdom is like a net full of fish – good and bad. It hasn’t been sorted out yet. It is a work in progress – we should not be so presumptuous to think that we are good fish, nor so pessimistic to think that we are bad. Rather we show our faith by living it out in our lives – the kingdom is here among us, right here, right now. We are to live resurrection lives and to proclaim the truth of our faith to the world, so that it too may believe. The kingdom is like someone who brings things out, both old and new – rooted in scripture, the Word of God, and in the tradition of the Church – rooted, grounded, authentic, recognisable, not making things up as we go along, or going along with the ways of the world, because it suits us. There is something refreshing and new about orthodoxy, because it is rooted in truth, the source of all truth, namely God. It is old and new, a well which never runs dry, because it is fed by God, something which can refresh us, and which gives true life to the Church. The challenge for us, as Christians is to live out our faith in the God who loves us and who saves us. We should not compartmentalise our lives so that our faith is a private matter. It needs to affect all of who and what we are, what we think or say or do. It is something primary, and foundational, not an optional extra, not some add-on, but the very ground of our being. It is a big ask; and if it were simply up to each and every one of us, then we would, without doubt, completely and utterly fail to do it. Yet such is the love and forgiveness of God, that His mercy is never-ending, and as people forgiven by God, we likewise forgive each other and are built up in love together, so that the work of the Kingdom is a corporate matter, a joint effort – we’re all in it together – it is what the church is for – a bunch of sinners trying to love God and serve Him, and likewise loving and serving each other, and the whole world. We celebrate the Feast of the Holy Trinity today because in 1334 Pope John XXII decided that on the Sunday after Pentecost the Western Church would celebrate the Trinity. It was already a popular feast. Nearly two hundred years previously Thomas Becket was consecrated a bishop on this day, and kept the feast. Its popularity in the British Isles is shown by the fact that we number the Sundays between now and Advent not ‘after Pentecost’ but ‘after Trinity’. It defines the majority of the liturgical year for us. This morning, at the very beginning of our service, the following words were said, ‘In the name of the Father, and of the Son, and of the Holy Spirit.’ We said ‘Amen’ to signify our assent and many Christians make the sign of the Cross as the words are said. At the end of the Eucharist I, as the priest, will pray that God will bless you as I invoke the name of the Trinity and make the sign of the Cross. These words and gestures are not random, or the result of a whim, but are part of our tradition of worship as Christians. This is how we express and declare our faith; through words and actions. These help us to reinforce what we believe and help us to live out our faith. In this morning’s epistle we heard the closing words of Paul’s Second Letter to the Corinthians. Their relations have not been been easy or pleasant. Paul has written urging reconciliation, something which the church always needs, and something at the heart of our faith. This is because it is what Jesus achieves on the Cross, our reconciliation with God and with each other. Paul urges the church to embrace in love, as we will soon do during the Peace. He ends with words which are very familiar to us: ‘The grace of our Lord Jesus Christ, and the love of God, and the fellowship of the Holy Spirit be with you all.’ (2Cor 13:13) We often repeat these words, and call them ‘the Grace’. This Grace of Our Lord Jesus Christ is the unmerited kindness we have received through him, which we do not deserve. We have not earned it, but receive it through Him. The Love of God is such that He gave His only Son ‘that whoever believes in him should not perish but have eternal life. For God sent the Son into the world, not to condemn the world, but that the world might be saved through him.’ (Jn 3:16-17). The Love of God sees Jesus take flesh by the Holy Spirit, to be born of the Blessed Virgin Mary, preach repentance and the nearness of the Kingdom of God, and die for us on the Cross. Then he rose again, ascended, sent the Holy Spirit to us at Pentecost, and promised to come again as our Judge. Fellowship, or Communion is what the persons of the Trinity – the Father, the Son and the Holy Spirit – have between each other, and which we the Church are invited to share. It is the imparting of the grace, the undeserved kindness of God. In the act of Holy Communion we are fed with the Body and Blood of Christ, so that we might share in the divine life here on earth. We can do this because we have been baptised. In this morning’s Gospel Jesus tells the apostles to go and make disciples ‘baptizing them in the name of the Father and of the Son and of the Holy Spirit’ (Mt 28:19). This is the central act of our faith, it is how we enter the Church; how we put on Christ; how we are saved. It defines us as Christians. In public prayer, at the end of Psalms and Canticles, we end with the words, ‘Glory be to the Father and to the Son and to the Holy Spirit ; As it was in the beginning is now and ever shall be world without end. Amen.’ This is a doxology which means ‘Words that praise God’ We say these words because they express our faith. Jews, Muslims, Jehovah’s Witnesses, Mormons and others cannot accept the fact that as Christians we say that we do not worship three Gods, but One God. That we believe that the Son is God, not less than the Father, likewise the Holy Spirit, and yet there are not three Gods but one God. These are not manifestations, but persons which share the same divine essence and yet are distinct. The Father uncreated; the Son begotten; the Spirit proceeding. It is why we stand up and state our beliefs. It matters. We do it regardless of the cost. Simply believing the Christian faith and declaring it publicly can lead to imprisonment or death in some countries around the world today. Our faith matters. It can change lives. It can change the world. It isn’t a private concern, something to be hid away politely. It is the most important thing there is. It is something to fill us with joy. It is something that we should share with others, so that they might believe and give glory to God the Father, God the Son, and God the Holy Spirit, to whom be ascribed as is most right and just, all might, majesty, glory, dominion, and power, now and forever. Love tends to become like the one loved; in fact, it even wishes to become one with the one loved. God loved unworthy man. He willed to become one, and that was the Incarnation. We have come here tonight to celebrate something which defies our understanding and expectations. The simple fact that the God who created all that is took flesh in the womb of the Virgin Mary and was born for us in Bethlehem as the Messiah, the Anointed of God, who would save us from our sins, should still feel strange and odd. It simply doesn’t make sense, nor indeed should it. In human terms, Mary should have been stoned to death for extra-marital infidelity, and some thirty three years later her son is executed as a blasphemer, a rabble-rouser, a trouble maker, in an awkward backwater of the Roman Empire, having gathered round himself a small group of misfits and undesirables appealing to the baser elements of society. There is nothing respectable here, just the rantings of religious extremists. And yet here we are, some two thousand years later, celebrating the birth of a child who changed human history and human nature, because we do not judge things solely by human standards. We come together so that we may ponder the mystery of God’s love for us, a God who heals our wounds, who restores broken humanity, who offers us a fresh start, who can see beyond our failures and shortcomings, and who becomes a human being so that humanity might become divine, so that we may share in the divine life of love, both here on earth and in heaven. If that isn’t a cause for celebration, I honestly don’t know what is. We are so familiar with the story of Christmas that I wonder whether we, myself included, really take the time to ponder, to marvel at the mystery which unfolded two thousand years ago in Bethlehem. God, who made all that is, comes among us, taking flesh in the womb of a young girl through the power of His Holy Spirit, so that in His Son we might see and experience God and His love for us. God comes among us not in power or splendour but as a weak, vulnerable child, depending on others for love, and food, and warmth, laid in an animal’s feeding trough, insulated from the cold hard stone by straw – beginning his life as he will end it placed in a stranger’s tomb. Throughout his life all that Christ says and does shows us how much God loves us. The Word becomes flesh, and enters the world, he dwells among us, a wondrous mystery which provokes us to worship, to kneel with the shepherds and to adore the God who comes among us, who shares our human life so that we might share His divine life, not because we asked for it, not because we deserve it, we haven’t worked for it, or earned it, rather it is the free gift of a loving and merciful God, this then is the glory of God – being born in simple poverty, surrounded by outcasts, on the margins of society, to call humanity to a new way of being together, where the old order is cast aside, turning the world upside down and offering us the possibility of living in a radically different way, a way of peace and love and joy, not one of power. Heaven comes to earth, born in the womb of a Virgin, so that we might behold the glory of God in a new-born child. So that we might experience the love and truth of God. The word is made flesh so that prophesy might be fulfilled, so that the hope of salvation might be dawn, so that a people who have languished long in darkness might behold the glory of God where heaven and earth meet, in a stable in Bethlehem, where men and angels may sing together ‘Alleluia, Glory be to God on high, and on earth peace to people of goodwill’ The worship of heaven is joined with earth on this most holy night, that in the quiet and stillness all the earth might be filled with the praises of Almighty God, who stoops to save humanity in the birth of His Son. The Son who lives and dies and rises again for us will be here tonight under the outward forms of bread and wine so that the heavenly banquet may nourish our souls. He gives Himself so that we might share His Divinity, that God’s love can transform our human nature, having redeemed it in His Nativity. So let us come to sing his praises, and be nourished with His Body and Blood and experience here on earth the joy of Heaven and the closeness and the love of God, let it fill our souls with joy, and let us live lives which recognise the wondrous thing which happens tonight, that it may be a reality in our lives, that we may may proclaim in word and deed the reality of the Word made flesh, so that others may be drawn to kneel and worship like the shepherds, like the Holy Family of Mary and Joseph, and come to believe and give glory to God the Father, God the Son, and God the Holy Spirit, to whom be ascribed all might, majesty, glory, dominion and power, now and forever. About 1700 years ago the passage from the Book of Proverbs which is the Old Testament Reading which we have just heard was at the centre of a theological controversy which threatened the nature and existence of Christianity as we know it. Arius, a priest of Alexandria used the passage ‘The Lordcreated me at the beginning of his work, the ﬁrst of his acts of long ago. Ages ago I was set up, at the ﬁrst, before the beginning of the earth. When there were no depths I was brought forth, when there were no springs abounding with water. Before the mountains had been shaped, before the hills, I was brought forth’ to prove that Wisdom, which was understood as the Logos, the Word of God, the Creative Intelligence was not pre-existent, that it was a creation, and that ‘there was a time when he was not’. He may have been attempting to uphold what he understood as monotheism and the supremacy of God the Father, but in so doing he threatened the very nature of Christianity itself: denying the eternal nature of the Son of God, seeing Him as a creature, something created, something less than God. His position caused something of a ﬁghtback, and the church began to deﬁne the nature of God the Father, and God the Son with greater clarity, and while the orthodox position sometimes found favour with Imperial power, and sometimes did not, in the end political power could not enforce heresy. The views of Arius while condemned by the church and seemingly dead and buried once again found widespread fame with the arrival in 2003 of Dan Brown’s novel, The Da Vinci Code, with which you are no doubt familiar. I’ve read it, it is a rip-roaring page-turner of a book, but it is not based on the truth, it is a work of ﬁction, which may be plausible, which may be fun to read, but which is not true. The idea that the church and state colluded to airbrush out the truth and replace it with an oﬃcial version is simply not borne out by the facts. After Constantine, his son Constantius II reversed the policy of his father and was sympathetic to the Arians. This is hardly the practice of a cover-up, indeed the facts do not support the hypothesis – it’s fanciful but basically no more than a conspiracy theory. 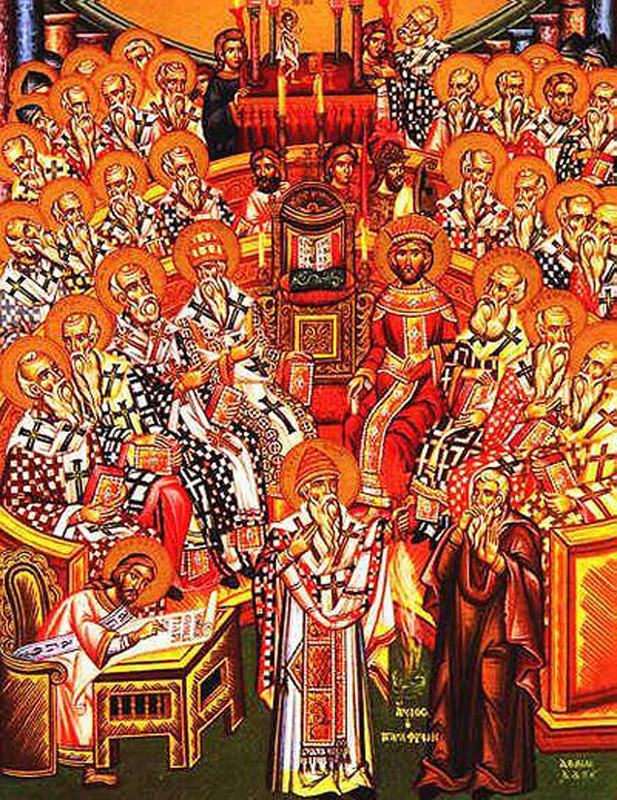 The Church formulated its beliefs in creedal statements ﬁrst at Nicæa and later revised at Constantinople just over 50 years later, these are the words which we are about to say to express what the Church believes about God – we say them because they are true and because they help us to worship God. The second reading this morning from St Paul’s Letter to the Colossians is a statement of belief, an early creedal statement which focuses on who and what Jesus Christ is and what he does, written only some thirty years after his Crucifixion. Christ is the first-born in whom all creation has its existence. Creation exists because God was pleased to dwell in him in all his fullness and through him to reconcile all things whether in heaven or on earth. Christ’s great work is to reconcile all things in heaven and earth, making peace by the blood of his Cross. Our Lord’s Passion, Death, and Resurrection alter the created order in a fundamental way and are the outpouring of God’s love on the world, to heal it and restore it. This encapsulates what we believe as Christians and why we are here today to pray, to be nourished by Word and Sacrament, so that through our participation in the Eucharist, in Holy Communion, we may partake of His Divine nature, and be given a foretaste of heaven. Christ became human so that we might become divine. This profound and radical statement lies at the heart of the Prologue to John’s Gospel, a passage which we cannot hear too often, simply because it is wonderful and it manages in a few verses to cover the entirety of salvation history from the Creation of all that is to the Incarnation, when the Word became flesh and lived among us and we beheld his glory full of grace and truth. God became a human being, for love of us, to show us how to live, and to give us the hope of heaven, or as John’s Gospel later puts it ‘For God so loved the world, that he gave his only Son, that whoever believes in him should not perish but have eternal life. For God did not send his Son into the world to condemn the world, but in order that the world might be saved through him.’ (Jn 3:16-17) The Christian life therefore is one characterised by joy, by hope, by love, and forgiveness, it is to be freed from the way of this world given that we celebrate a Divine authority which is before and over all things. At the heart of our faith as Christians is a wonderful message of freedom, knowing that this life is not all that there is, that we are called to have life in him and life in all its fullness, and to live for and through him. This is our faith: it is what we believe and what we are to live, here and now, for the glory of Almighty God and the furthering of his kingdom. So let us live it, supporting each other in love, in prayer, and forgiveness – helping each other to proclaim by word and deed the Good News of Jesus Christ to a world which longs to hear it, which longs to be freed from selfishness and sin, to come to new life in the living waters of baptism and to live out that life in the Church, the Body of Christ, loved by Him, fed by Him, fed with Him, restored and healed by Him, set free from the ways of selfishness and sin to have life in all its fullness, even eternal life in Him. It has been said that in the hereafter there are two smells: brimstone and incense. Needless to say, we should prefer the latter to the former, and also it reminds us of the religious practice of our brothers in faith the Jews: incense was offered in the Temple to God every morning and evening, a laudable practice which the Church continues. but above all for thine inestimable love in the redemption of the world by our Lord Jesus Christ; for the means of grace, and for the hope of glory. Our worship expresses our hope, our thanks and our praise, it reminds us to be grateful for what God has done for us, in giving His Son to be born for us, to proclaim the Good News of the Kingdom to us, to die for us and to rise again for us, to show us how we might have life and life in all its fullness in and through Him. Therefore our vocation as Christians is to be a joyful people. There is nothing worse than seeing a sad miserable Christian: we are called to proclaim Good News, to live out the new life of our baptism, regenerate, born again, singing the praises of God who rather than condemn us loves us and saves us, who gives himself as priest and victim upon the altar of the Cross so that we might feed on Him, to heal our wounds, to transform us, so that His Grace can perfect rather than abolish our nature – it is wonderful, utterly mind-blowing, it has the power to transform the entire world if only we could stop getting in the way, and let the transformative power of God’s love be at work in the world. We proclaim this Good News in our thoughts, our words, and our deeds, and the more we do it, the more it shapes our character, making us people of praise, people of worship – it can become all-encompassing, taking all of who and what we are, and using it for God’s good purposes. This is what Our Lord means when he says ‘whoever loses his life for my sake will find it.’ (Mt 16:25) This is life in all its fullness for we are never more fully alive than when we worship God, demonstrating our love for Him, and letting His love shine through us. This characterised the first Apostles – how could they do otherwise after what God had done for them in Jesus, and we should be just like them, with the same singularity of vision and purpose. So let us worship God not only with our lips but with our lives, so that all we are, all we say, all we think, all we do, may praise God the Father, God the Son, and God the Holy Spirit, to whom be ascribed as is most right and just, all might, majesty, glory, dominion and power, now and forever.